Brewed in the UK by Shepherd Neame. Born out of a desire to create a beer that would compliment food, Asahi Super Dry quickly became the most popular beer in Japan. And with a population of 127 million people, that's saying something. 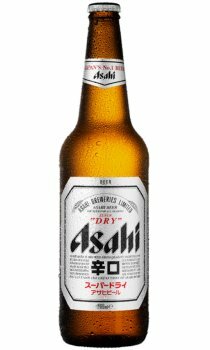 Now available in over 50 countries worldwide, the refreshing taste of Asahi Super Dry, with it's 5%abv, has made a major impact in Europe where it's an established No 1 among discerning beer drinkers - including the UK where it is the top selling Japanese lager. No wonder it's been voted as a Cool Brand, by Superbrands Ltd, for 5 consecutive years.